As is evident from the name, this kind of tanzanite emanates a stark similarity of hues from a male peafowl found in the Indian subcontinent. The embodiment of colours transitioning between bright green and royal blue makes it an ethereal sight. Pristine, beautiful, and colour-changing, tanzanite has always been a favourite among the gemstone collectors. Every property of stone is enhanced in this stately variety, called the peacock tanzanite. The bi-colour gemstone harbours a fantastic combination of the colours spotted on an Indian peafowl, where the stone draws its name from. With mostly transparent variations, peacock tanzanite throws off different colours when viewed from different angles. A variety of the family of tanzanite, this particular kind demonstrates a riveting transition of hues from bright and chipper green to engaging blue. These stones are crystal-clear to look at it, with subtle shades of colours and almost no inclusions of cloudiness or flaws. They rank 6.5-7 on the Mohs scale of hardness, which makes them long-lasting and rigid; fit for long-term use. In terms of treatment techniques, the bi-colour stones go under an intense two-hour heat treatment, which enhances the colour, clarity, and lustre of the stones. The said treatment is why they retain the rich colours. This treatment also ensures that the stones are resistant to higher temperatures and withstand the colour and quality through. The origin of the category “tanzanite” comes from where it has been mined from. Found abundantly in Tanzania, this stone is considered to be a variety of Blue Zoisite. The miners in Tanzania use both traditional as well as modern technique to procure the stone. The government in the country has divided the mining area into four blocks, namely “A,” “B,” “C,” and “D.” Most of the quantity is acquired from the Block C. This kind rarely makes up to the 10% of total extraction, which is not a lot but it makes them 10,000 rarer than diamonds. As per the availability in other colours, tanzanite is rarely found in any other colours that are not hints of blue and green. 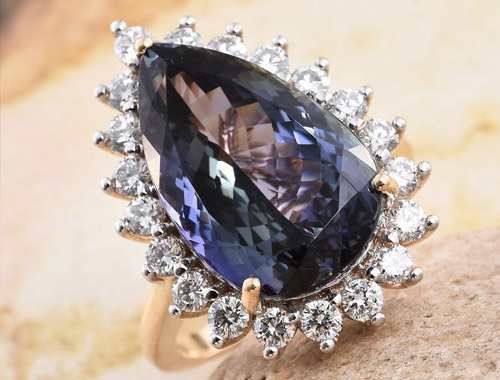 Additionally, tanzanite has also not been manufactured through artificial processes till today, albeit it does go under heat treatments to bring out its colour and clarity. The trichroism property of the stone allows it to flaunt the presence of three different colours when viewed from different angles under the light. When it comes to the availability of the cut and clarity of the stones, they are best suited for rings and earrings. With the almost iridescent hues of the stone matched with the glass-like clarity, their looks are enhanced with the chiselled facets. They hold a flawless vitreous lustre when polished, which makes them ideal for solitaire or centre-placed jewellery, although the cluster formation only magnifies their incredible sparkle. Peacock tanzanites are not found in larger sizes, much to the dismay of jewellers. Although instilled with excellent transitioning hues, the stones are notoriously difficult to cut. So, with the rise in the carat size, usually, the market price goes up in direct proportion. With its high ranking on the Mohs scale, the stone proves to be resistant to superficial cuts and abrasions. The most-suited cuts that the stone is chiselled into are round, oval, and marquise. Tanzanite is known to be the birthstone of the month of December and it’s also believed by several healers that the stone also has metaphysical healing properties. Considered to be a very powerful stone, tanzanite accelerates high spiritual growth according to several legends. Many astrologers across the world claim it to primarily activate the heart chakra, which leads you to feel and experience the power of divine love. Some maintain that if you keep meditating with the stone close by, you might even unlock your dormant psychic abilities. This alone might be a reason why so many people regard tanzanite as a Godly stone." To clean the stone, use gentle soap and lukewarm water. If absolutely necessary, you can also use a soft-bristled toothbrush to clean the underside of the stone. After rinsing, use a soft towel or chamois cloth to pat dry. It’s a variety of the main stone called Tanzanite, extracted from and found in Tanzania. It ranks 6.-7 on the Mohs scale of hardness, which makes it resistant to superficial scratches and brittle. It is almost 10,000 times rarer than diamonds, due its lack of supply. The stone goes under a heat treatment process to get rid of the imperfections like brown-ish spotting and other minor flaws. The heat treatment also makes it resistant to higher temperatures. The stone is not known to be found easily in larger sizes as it is very difficult to be cut. Therefore, it is used in cluster designs, where it reflects a charming play of colours.